This is the intro to Tanya Lee Stone's thought-provoking biography for younger readers that highlights Elizabeth Cady Stanton's life story and focuses on her pivotal role in the Women's Suffrage Movement. What is most impressive about this biography is that Stone effectively conveys a clear picture of Cady Stanton's personality and spirit AND gives a great overview of the beginning of the movement using clear and concise language. Rebecca Gibbon's illustrations are rendered in gouache and colored-pencil on paper and compliment the story's vibrant and fast-paced tone. Readers are not overwhelmed with facts and leave with this message: Cady Stanton was a courageous, determined, and well-respected person whose efforts and persistence inspired others to continue in her footsteps and ultimately win the right to vote for women. It's a very inspiring and engaging story. Now THIS is a book that I would recommend to any parent of a child who loves nature and animals, reluctant readers, and science teachers. Wild Tracks! : A Guide to Nature's Footprints is just what the title says it is, a guide to nature's footprints. Arnosky introduces the book saying, "When you learn to recognize and read animal tracks, you are learning an ancient language of shapes and patterns. The shapes of the footprints reveal the identity of the track maker. The pattern of the tracks tells a story about what the animal was doing." The book sets out to show readers HOW to tell animals' stories through the tracks they leave behind. The short narratives in each section provide interesting information about animals found in the wild and their tracks, but the showpieces of the book are the pencil and acrylic illustrations of life-size animal prints, from moose and bears to beavers and geese. These are what will draw readers in, and with the simple captions by each set of tracks, readers don't even have to read the narratives that accompany each section to learn the animals' stories. What's more, there are four pull-out sections that show the life-size prints of deer, other hoofed animals, felines, and canines. The foldout section of life-size prints includes illustrations of deer both walking and running to show readers how they can determine the difference. Pretty darn cool. The style and approach used in this book really is the perfect way to engage readers and keep them coming back again and again. I highly recommend it. If you live near a wooded area, take your child on an animal tracking adventure. See how many tracks you can find, and try to determine the animal's story. It may be helpful to some initial research on the types of animals that live in your region so that you will be able to better identify the tracks. For example, if you don't live in the Florida Keys, you won't find Florida Key Deer tracks, but if you live in the eastern woodland region, you may find White-Tailed Deer tracks. Have children draw images of the prints they found. Put them on a bulletin board to show the variety of animals that live in your region. For science units on habitats and species, this book could serve as a perfect jumping-off point for learning about the different wildlife you're planning on studying. I don't see any other blog reviews of this title, but I do see that the Allen County Public Library Mock Sibert blog has it listed as one of this year's contenders, and two readers have given it five star reviews on Amazon. Greater Estimations by Bruce Goldstone. When it comes to guessing how many jellybeans are in a jar, I've always been WAY off, but after reading Bruce Goldstone's Greater Estimations, I might have a standing chance. A follow-up to Goldstone's 2006 Great Estimations, this book gives three strategies for making estimations that are as close to the actual number as possible: eye training, clump counting, and box and count. The book starts out with a page full of rubber duckies lined up above the text, "The ducks are coming! About how many rubber ducks are marching toward you?" This is the same image that you see on the cover. When you flip the page, you see 100 ducks in groups of 10, and on the opposite page, there are 100 more ducks in a mambo line. These two pages serve as the introduction to the "eye training" strategy, showing readers how to train their eyes to see 100 ducks. And on the next page, we see 1,000 ducks and 10,000 on the opposite page. Throughout the book, Goldstone demonstrates the three estimation strategies using pictures of popcorn kernels, groups of skydivers, bees, plastic animals, glow-in the dark stars, red blood cells, and more to estimate number, length, height, weight, and volume. While all of this estimating can be fun for kids, Goldstone points out in his author's note in the back of the book that estimation is a very helpful tool in real life for many professionals like doctors, astronomers, carpenters, scientists, and even event planners. This would be a helpful and fun book in math and science classrooms! Here's another book by The Global Fund for Children team that makes a wonderful classroom resource. Children of the U.S.A. takes readers on a journey across the United States, stopping at 51 cities, one in each state, plus Washington, D.C. In each city, we learn more about the city and state and the diverse children who live there. On the two-page spread for each city, there is also a box that gives more information about it, including population, year founded, nicknames, and sister cities in other parts of the world. There are also beautiful full-color photographs of children in the city. Along the way, we're introduced to a number of religions, cultures, customs, and a brief history of the immigrants who've made our country a unique place rich in culture and diversity. Not only does the book present fun facts and interesting information, but it also helps promote tolerance and an appreciation for diversity. For a classroom book, assign a different city to each child, each one being responsible for creating a spread for the book. For teachers with the resources and access to a computer lab, you could even create a template with something as simple as Microsoft Word and have students drop in their own information. Children could even take home their own copies of the book if resources allow. Children can write a story or create a piece of art representing their assigned city, state, culture, etc. Learn more about The Global Fund for Children! Continuing with this week's theme of nonfiction children's books for classrooms, today, I'm bringing you a biography of a hero about whom I'd never heard until I read Betsy Bird's review at Fuse #8. So, when I saw this book sitting on the "new nonfiction for kids" shelf at my library last week, I immediately picked it up. The book tells the story of Robert Smalls, who was born a slave in 1839 on a South Carolina plantation. All his life, he dreamed of freedom. When his daughter, Elizabeth was born in 1858, he worked out a deal with his master to buy his wife's and daughter's freedom for $800 even though he would remain a slave. It would take a long time, but when the Civil War begins and Robert becomes a wheelman on a Confederate steamer, he devises a plan to escape, knowing that if he's caught, he, his entire family, and every other slave on the steamer would be killed. The rest of the book focuses on Smalls' daring escape that will leave readers on the edge of their seats. The back of the book includes an afterword with more information about Smalls, including a photograph, as well as a list of sources. I really love Lee & Low's books because they choose to publish books that tell the stories of virtually unknown heroes and role models. I've been impressed with every one of their biographies that I've read: A Song for Cambodia (my review), Louis Sockalexis: Native American Baseball Pioneer (my review), Hiromi's Hands (my review), Surfer of the Century: The Life of Duke Kahanamoku (my review). Seven Miles to Freedom: The Robert Smalls Story is no exception. From the moment I opened the book, I was drawn into Smalls' story, and by the time, I got to the escape, I was tense and nervous and almost afraid to turn the page. What if he got caught? What if his wife and children were killed? 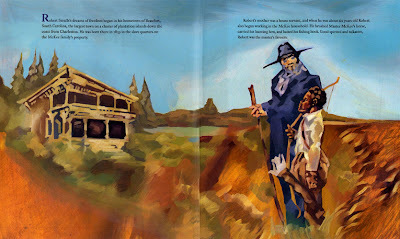 On my first read, I was so entranced with the story that I didn't even look at Duane Smith's oil paint impressionistic illustrations, and as I looked at the book a second time, I have to say that they really aren't my favorite. Don't get me wrong. They're not bad; it's just that I couldn't really tell what the story was about by just looking at the illustrations. They merely accompanied the story rather than tell it. That aside, the story is fascinating, and I think children will truly admire Robert Smalls' courage and tenacity. They'll also appreciate learning about a Civil War hero they may have never heard of, and I'm sure teachers will also find this refreshing. It's NONFICTION MONDAY!!!! Get more nonfiction choices at Picture Book of the Day. There is officially only one more week of summer left, and this is officially the last full week of the Family Reading Challenge. Next week, I'll post some important lessons I've learned and hold the final giveaway. This week, I thought I would do something a bit different and give the winner a choice of five books from a list of ten. What the winner doesn't pick will be available to next week's winner. Karen, please email your address to thewellreadchild AT gmail DOT com, and I'll send your choices out to you! Note: Starting today, and for the rest of the week, I'm going to be sharing a variety of nonfiction children's books that would make excellent classroom resources. All of the books, aside from today's selection, have been published this year. Even though this book has been around for a while, it's chock full of learning opportunities for children. Brought to us by The Global Fund for Children, the book introduces children to 25 countries around the world and one imaginary land, Xanadu. Starting with Australia, the book presents a different country for each letter of the alphabet. For each country, children can read fun and interesting facts, information about the children in the country, and even how to say and pronounce that country's world for hello. In addition to the narrative about the country, each spread also contains a section that lists the country's flag, capital, languages spoken, population, number of children, favorite sports, an environmental fact, and names of other countries that begin with the same letter. Each spread also includes a map of the country, showing where it is in the world along with its neighbors. In addition to all of the information you can learn, each spread includes beautiful full-color photographs of children in that particular country. For example, in the Philippines spread, we see smiling children on the beach covered in black sand, girls dancing to the music of gongs and bamboo flutes, boys playing basketball, and a young girl weaving colorful fabric on a loom. The information in the book is well-organized and presented in an easy-to-read, conversational tone. Unlike similar books in this genre, kids are not overwhelmed with facts. In fact, the authors selected information that really appeals to children. Most importantly, the book introduces children to diverse cultures and demonstrates the similarities among children regardless of where they're from, what they look like, and what language they speak. This would make an excellent addition to any home, school, or classroom library. Have children create their own alphabet books featuring countries from the "other countries" list on each page. For a classroom book, assign a different country to each child, each one being responsible for creating a spread for the book. For teachers with the resources and access to a computer lab, you could even create a template with something as simple as Microsoft Word and have students drop in their own information. Children could even take home their own copies of the book if resources allow. While this is a book that is officially designated for adults, I believe that it will appeal to many teens, and if you, parents, have not read it, I encourage you to do so. And please don't let the fact that it's an Oprah's Book Club selection thwart you from reading it. (She does alright sometimes.) I rank this book among the best I've ever read. As I read this, I was immediately drawn in and overcome with a sense of dread and hopelessness. What horrific event has happened? What is this granitic beast these pilgrims are running from, and where are they headed? It's obvious that the man loves this child and is consumed with fear for the child's life. Otherwise, why would he wake up in the middle of the night to check to see if the child is still living? Is the child sick? These questions were soon answered as I continued reading. The man and the child, his son, are perhaps one of the few survivors of a cataclysmic event, one of which is never really described in the book, but we get an all too close look at its aftermath. Realizing that he and his son cannot survive another winter in their current location, the man has planned a journey to the south. As they travel the roads of a post-apocalyptic United States, we get a glimpse into the horror of what humanity has become. Many of the survivors have banded together and have become cannibals, rapists, murderers. The man and the boy live in constant fear of being caught, and the man has instructed the child to commit suicide if they are ever caught. Adding to this danger is the threat of starvation, exposure to the elements, illness, and exhaustion. Needless to say, you can see why the man awakens in fear every night. But his all-consuming fear is having to kill his son himself if his son is unable to commit suicide if it ever gets to that. The boy, who was born soon after the destruction, has never known any other life, but he is the epitome of good surrounded by so much evil. During their journey, events happen that seem to eat away at his soul, and he is devastated when they cannot help others they meet along the way, even the ones who have every intention of killing them. This is an extremely powerful book...so much so that it's very hard to describe in words. It's about the love between a parent and child, the horrors of what humanity can be capable of, the struggle for survival, and even the quest for good. I didn't want to put it down, yet sometimes it was so emotional and gut-wrenching that I just wanted to throw it across the room. As a parent, I identified with the man, and now, the question that keeps running through my head is, "how far would I go to save my child from pain, from terror, from a fate where death is the best option?" Parents, teachers, and homeschool parents, here is a great resource for animal lovers and for lessons covering geography, ecosystems, species, habitats, colors, adjectives, and much much more. 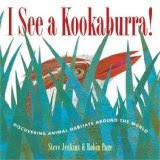 The superstar husband and wife team, Steve Jenkins and Robin Page, introduce children to interesting information about animals and their habitats around the world in a very fun hide-and-seek format. Jenkins and Page introduce each habitat with a spread of eight animals hiding in the flora of the habitat illustrated with Jenkins' familiar cut and torn paper collages. For example, on the page that covers the desert, we see a kit fox's nose and ears hiding behind a cactus, the rattle of a diamondback rattlesnake poking up behind a rock, the legs and eyes of a trapdoor spider peeking out of its tunnel in the ground, and more. Here, the only text on the page is, "In the desert I see... This desert is in the American Southwest. When you flip the page, all of the flora has disappeared, and you see where all eight animals were hiding on the previous page. Beside each animal is a short passage that completes the "In the desert I see..." sentence. For example, "...a sharp-eyed kit fox leaving its burrow," "...an angry diamondback rattlesnake buzzing a warning," "...a trapdoor spider waiting patiently in its tunnel." As an added surprise, somewhere in each habitat is an ant because as the authors explain in the book's introduction, "they live almost everywhere on earth." The back of the book includes a longer paragraph about each animal featured in the book and more information about the habitat in which they live. I'm a huge fan of Page and Jenkins because they really do make nonfiction and learning fun, and I See a Kookaburra! : Discovering Animal Habitats Around the World is no exception. The interactive hide-and-seek element engages children and encourages them to turn the page and find out where the animals are hiding. Without even realizing it, they're learning and having fun at the same time. While some of the critics have said that the disproportionate sizes of the animals may confuse kids, I think kids are smart enough to see that these are just depictions of animals. They know that a jaguar is bigger than an iguana and won't mind that the animals are not drawn to scale. I often think adults don't give kids enough credit when I see comments like these. As I mentioned earlier, the teaching possibilities are endless and can be used across curricula. If you're looking for interesting and engaging nonfiction, you can't go wrong with Jenkins and Page. I've decided to devote some of my reading time to re-reading some classic books that I loved as a child and to reading some books that I've always wanted to read. For example, did you know that I've never read a Lemony Snicket book? The horror! Well, the Little House series is a series that I did read and LOVE as a child, and I was also an avid fan of the TV show. It's been so long since I've read the books that I wanted to start my "classics re-reading adventure" with this series. Little House in the Big Woods is the first book in the series and told from the third-person limited point of view of five-year old Laura Ingalls. Laura and her family, Ma, Pa, Mary, and baby Carrie, characters who were near and dear to my heart growing up, live in a long cabin on the edge of a Wisconsin forest. The pioneer life is a hard one, and the days are full of difficult and time-consuming chores. However, there is always time at the end of the day for Pa to play his fiddle and to tell Laura and Mary lots of stories, like the time he mistook a tree stump for a bear. However hard the day, it's quickly apparent that what's lacking in luxury is made up in love. As soon as I picked up the book and started reading, I immediately got the "warm fuzzies," as memories of Laura came flooding back. Believe it or not, I was delighted that I had forgotten so many details of the books, and it really felt like I was reading them for the first time. I was especially interested in Laura's accounts of killing the pig and curing the meat, churning butter, the maple syrup and cheese-making processes, and more descriptions of how pioneers lived and made things. There were, however, some instances in the book where I thought the details were sparse and didn't provide a clear picture of what was going on. For example, when Ma and Laura encounter the bear outside the barn, I just couldn't figure out where the bear was standing, even after reading the passage over a few times. Or in the cheese-making process, I couldn't understand exactly WHY the rennet from the calf was so crucial to making cheese. Granted, we are getting an account from a five-year old girl's point of view, but other stories are filled with details. That aside, I do think that this book will appeal to many young children, especially girls, even after all these years. It really is a wholesome, down-to-earth book about love, family, hard work, and a time long ago. I also think it would make a great read aloud for the entire family, and I'm looking forward to reading the rest of the books in the series and watching Laura grow. What about you? Were you a Little House fan? When I saw Terry's summary of this book at Scrub-a-Dub-Tub, I knew I had to have it for my daughter, my own Isabella. I immediately pre-ordered a copy and was delighted when it arrived a few weeks ahead of the official publication date. "Good morning, Isabella," the mother said. "It's time to get up and out of bed." "My name is not Isabella," said the little girl. The little girl exclaims that she is Sally, and we see a picture of an astronaut in space. As the day goes on, she pretends to be many famous women who've made history including Rosa Parks, Annie Oakley, and Marie Curie. Each time the little girl proclaims her new identity, the reader learns a little about how each woman impacted history. This is an exceptional book on so many levels. First, the patient and caring mother encourages her child to dream big and use her imagination. Second, as the book progresses, we see how this has instilled confidence in the little girl as she proudly reclaims her real name before she goes to sleep. Next, near the end of the book, the little girl says her name is "mommy," showing how much she adores and admires her own mother as puts her in the ranks of such powerful female figures. Finally, children are introduced to many influential and inspirational women from history. You can't have enough books about admirable female figures, imho. My Name is Not Isabella is not only a perfect choice for young girls, but it would make an excellent resource in a social studies classroom. As a fan of literature-based instruction, I can see this being used as a supplementary resource in lessons about biographies, famous women from history, the civil rights movement, famous scientists, and more. The back of the book provides short biographical information about each featured woman as well as an extensive list of resources where you can find lots more information. Highly recommended. 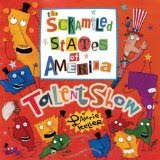 Oh my...Laurie Keller is one funny lady, and she's back with The Scrambled States of America. This time, the crazy states are putting on a talent show. Who knew geography could be so fun? "It all started simply, really. You flip the page, and all of the states are donning top hots and dancing "Fred Astaire," style. The rest of the book covers all of the preparation and practice that leads up to the big show itself. Indiana is the director, Arizona is the costume designer, and Washington D.C. is the emcee. Georgia has a severe case of stage fright, and Dr. Globe has to perform a number of tests, including performing x-rays of her counties and cities, to make the diagnosis. His "prescription" will make kids chuckle. The talent itself is varied. Some is predictable (Kentucky plays the banjo, and Pennsylvania plays the liberty bell), and some is downright hilarious. "Minnesota the Magnificent" saws South Dakota in half. The boy-band, the New States on the Block (New York, New Jersey, etc.) wow the ladies with their charm. Iowa, who looks like Rodney Dangerfield, tells some "corny" jokes. I could go on and on. Along with the funny text, there is commentary among the states. For example, when the New States on the Block are performing, Missouri, who is in the crowd exclaims, "He's pointing at ME" while Colorado rolls his eyes and says, "Oh, brother." Very very funny. Keller's illustrations are just as hilarious as the text, and I find something new and funny each time I look at the book. The end papers include two charts, one with statehood dates and the other with state abbreviations. Scattered all around the charts are various states commenting and asking questions. This book is an excellent way for kids to have fun learning about the different states, and it's perfect as a read aloud. Actually, you HAVE to read it aloud. The first time I read it, I read it to myself, and it was funny. But the second time, I read it aloud, and I cracked myself up. I especially had fun using a Georgia drawl. I highly highly recommend this book. 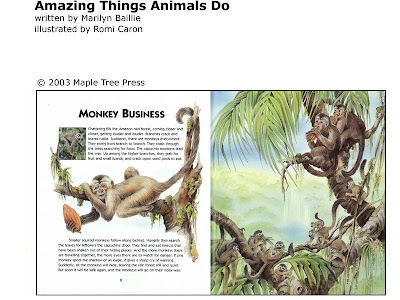 All four titles in the award-winning series, Amazing Things Animals Do, are now available under one cover with the same name, giving young readers an encyclopedia of fascinating facts about animals. Each section features 13 full-color spreads, presenting information about animals around the world. In addition to Romi Caron's captivating and realistic watercolor illustrations, a small photograph of the featured animal is on most spreads. 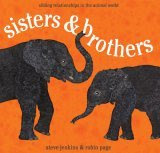 In the back of the book is a "Who's Who" guide giving more information about the animals and their habitats. This would make an excellent choice for kids who are interested in animals, and would also make a great resource for science teachers, especially when covering species and habitats. Because Ms. Baillie does not overwhelm the reader with content, this would make a perfect choice for reluctant readers. So, how are YOU doing with reading to your children as summer comes to a close? This week was a bit of a challenge for us. My little one is transitioning to the toddler room in day care, and all of the new activities and bigger kids wore her out. A few days, she was NOT tolerating being read to and only wanted to sleep. So, I guess the one thing I've learned is that "forcing" reading on a child is not ever going to work. It should definitely be a pleasant experience for everyone, and there are just some days when you're too tired or your kids are too tired to read. So, this week I decided to do another "grab bag" of books. This time, my daughter chose five books from the shelf. Congratulations! Ignoramoose, please email your mailing address to thewellreadchild AT gmail DOT com, and I'll get the books out to you ASAP. Because the fall is going to be extremely busy, I'm wrapping up the family reading challenge for the summer. Our last giveaway will be held on August 31, but I'll hold random giveaways throughout the fall. There are still two weeks left, and next week, I'm going to do the grab-bag thing again, only this time, I will give the winner a list of 10 books, and he/she can choose five from that list. Some children don't like to read. While that seems like a pretty obvious and simplistic statement, the reasons for WHY they don't like to read are complex and unique to individual children. Some may have a learning disability and may find reading to be a painful, frustrating, and even embarrassing process, especially when asked to read aloud in class. Some kids are involved in so many activities that they simply can't find the time to sit down with a book. And some find reading to be excruciatingly boring, given all of the other high-tech visually stimulating forms of entertainment out there. Regardless of the reason, there's no arguing that knowing HOW to read is a crucial life skill, and the more you read, the more well-rounded and successful you'll be in many aspects of life. If you find that your child is struggling with reading, talk to him or her about it, and try to get to the heart of the matter. If you suspect a learning disability, talk to a reading specialist, your child's teacher or principal, or another professional who can help assess the situation and provide services if necessary. But even if your child does require help from experts, there are still things you can do to help him or her develop a love for books or reading, and one of these is introducing your child to nonfiction. Another great thing about nonfiction is that many books are broken up into chunks with accompanying illustrations or photographs. This is great for kids who are either hesitant or unable to read long stories. They can flip through the book and choose to read what interests them the most. Perhaps the best benefit of nonfiction is that it demonstrates to reluctant readers that you can find a lot of great information in books and that reading can actually be enjoyable. With all of the material available out there, how do you go about finding reading materials for your child? Go straight to the source and ASK your child. What topic would he/she like to learn more about? What interests him/her? Perhaps it's insects, a sports figure, dinosaurs, or cooking. Once you get an idea about what your child likes, seek help from a librarian, teacher, other parents, etc. Don't take it all on yourself to find reading material for your child. Your local children's librarian can help you find books on the topic that interests your child, and because he/she is around books all day, he/she can quickly point you in the right direction. Don't worry too much about the book's suggested reading level. Sometimes we want to make sure that our children are reading at the appropriate level, and we may pass up books that are either above or below our child's reading level. With reluctant readers, the goal is really to get books into your child's hands, and good nonfiction has compelling pictures that your child will enjoy even if he/she can't read the text. If your child has difficulty reading the text, reading with him/her is a great bonding opportunity. Plus, you'll be around to answer questions and discuss the book's subject matter. If the book is below your child's reading level, that's still okay. It doesn't mean he/she is not learning. I can't begin to tell you how much I've learned from the nonfiction children's books I've read. Don't limit yourself to books. Because books can sometimes be overwhelming, try audio books or magazines. Even look for information on the Web. If a nearby museum has an exhibit on the topic of interest, plan a visit. In real life, we don't get all of our information from books, yet we're surrounded by words. Most importantly, make it fun. Forcing your child to read or learn information that's not interesting to him/her will backfire on your efforts to instill the joy of reading in your child. Here are just a few wonderful nonfiction books I've recently read and highly recommend. Check out the left sidebar of this blog to find more of my nonfiction book reviews. I.N.K. (Interesting Nonfiction for Kids): A blog authored by current authors of nonfiction who strive to provide children with interesting and compelling nonfiction. Nonfiction Matters: A School-Library Journal blog, that is "a place for lovers (haters, doubters, and creators) of nonfiction for younger readers to gather and think together about how to make it better." ** Neuman, Susan B. "Enticing a Restless Reader." Scholastic, Inc. Choosing a career path is quite a daunting task. Some people know from childhood what they want to do, but I think most people really don't know until later in life. Regardless of whether you know "what you want to be when you grow up" or not, it's always very interesting to learn about different jobs. Look at the success of Deadliest Catch and Dirty Jobs, two shows that fascinate me. I'm a little too squeamish to actually be a crab fisherman or one of the professionals on Dirty Jobs, but I'm interested in learning more about them, nonetheless. Each career gets its own two-page spread that features quotes from a professional in the field, full-color photographs, and lots of interesting information about the career. For example, we meet Jamie Miller, a master cheese maker. He works on a farm in Vermont that produces cheddar cheese, and the book covers the 12 steps in the cheese-making process, from cow to packaging. We also meet Andrea Lain, an archaeologist, who knew at the age of eight that she wanted to dedicate her life to studying the past. Her spread features a number of photographs of artifacts, including a deer jaw, a fragment from a 17th century chamber pot, and burned bone fragments found in a fireplace site. I like this book because it introduces careers that appeal to kids who are creative, and it may inspire them to nurture that creativity within them. The language in the book is easy to read and would make a good choice for reluctant readers. It's a definite must-have for libraries. Visit Picture Book of the Day for more great nonfiction selections. Now, I have mixed feelings about Oprah, but I think she's doing a good thing for children's literacy with her Kids Reading List. The list is divided into book recommendations for different age groups from Infant to Age 12 and up, and includes a nice mix of newer books and classics. The list also includes suggestions for making reading fun. There's no doubt that babies love to be held, touched, sung to, and kissed; and reading to babies can be an exceptionally bonding and rewarding experience. Child's Play International's Baby Gym series enables parents and other caregivers to bond with babies through reading, singing, touching, rocking, and more. The four board books in the series all feature short songs, movements, and activities that give parents and babies the opportunity to spend quality time together. 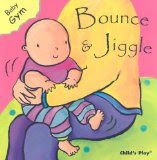 Bounce & Jiggle is a book for the times when you want to really play with and excite your baby. It features five songs or chants along with ideas for movements and motions you can do with your baby while singing or chanting. For example, one of the rhymes is "Humpty Dumpty." "Humpty Dumpty sat on a wall, Hold baby on raised knees facing you. Humpty Dumpty had a great fall. Slide baby down onto your stomach. Couldn't put Humpty together again." Tickle baby all over. This rhyme can also be played with baby sitting on lap. The bottom of the page also says, "Encourage your baby to join in by clapping to the rhymes. Baby will want to copy your mouth movements when you sing." 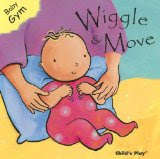 Another book in the series, Wiggle & Move, features songs and chants that encourage babies to move. For example, my daughter's favorite is "Roly Poly:"
"Roly poly, roly poly, up, up, up! Lift baby's arms up. Roly poly, roly poly, down, down, down! Point baby's arms down. Roly, poly, roly poly, out, out, out! Point baby's arms forward. Roly poly, roly poly, in, in, in! Hug baby. "Movement helps to stimulate your baby's brain." When you want to spend some time tickling and massaging baby, Touch & Tickle offers up five songs and chants that will make your baby giggle and also provide the stimulation they need. "Two Little Eyes," that ends with "nuzzling baby's tummy," never fails to make my daughter shake with laughter. 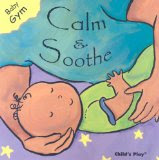 Finally, for those quiet moments, Calm & Soothe offers five short lullabies that help babies drift off to sleep. In this book, the instructions mostly have caregivers rocking and softly swinging the baby. Lullabies include favorites such as "Hush, Little Baby," and "Twinkle Twinkle Little Star." Child's Play International sent review copies of all four of these books just a couple of weeks ago, and they've quickly become favorites in our house. My daughter loves to hear me sing (she's probably the only person in the world who does), and she loves to imitate the movements. Sanja Rescek's colorful illustrations of cute cherub-faced babies are perfect for babies and toddlers. I also appreciate that there is diversity within the books, although the covers don't convey this. My only real complaint is that I wasn't familiar with some of the songs in the books, so I just made up my own tune. It would be great to have an accompanying CD. I highly recommend these for parents, grandparents, and caretakers of infants and toddlers, and I think they're also a great way to help older siblings bond with their younger brothers and sisters. We've had some amazing weather here that has kept us outside more than usual, and I must confess that our reading time as a whole has definitely diminished. We have, however, managed to read to our daughter a little bit every day. More often than not these days, she wants to choose the book and turn the pages herself, which is really cool. My personal reading has slowed down a bit this week. I went on a reading rampage over the last two weeks, so I could finish The Twilight Saga, so I took a week off from reading books and stuck to magazines. We're also really into the Olympics, so I predict that reading overall will slow down quite a bit until the closing ceremonies. Congrats Lauren! Please email me at thewellreadchild AT gmail DOT com w/ your mailing address, and I'll get the books out to you this week! This was fun, so up for grabs next week is another Surprise Grab Bag of five books (children, young adult, and adult) for the winner. I will announce the winner and the book titles next Sunday. The contest is open to all participants who've signed up for the challenge. It's not too late to sign up as this challenge is ongoing indefinitely. If you haven't signed up and want to join, please leave a comment here, and I'll add you to the list. Next week, I'll choose a winner using Random.org, so be sure to check back then to see if you've won. I've been avoiding writing about Breaking Dawn because I was REALLY REALLY trying to think of something nice to say. Well, I don't have anything nice to say. Icky Icky Poo Poo. Luckily, Elizabeth Hand is more mature than me and summed up the series, along with a review of Breaking Dawn in The Washington Post. Warning...it contains spoilers, so don't read her review if you want to suffer through the torture of reading Breaking Dawn on your own. I wholeheartedly agree with her, especially when she says, "The most devoted readers will no doubt try to make excuses for this botched novel, but Meyer has put a stake through the heart of her own beloved creation." Alright, devoted readers. What's your excuse? I'm so honored to have received two awards from two wonderful bloggers! And I can't believe time slipped by so quickly, and I failed to thank them earlier. First, back in June, Diane at carp(e) libris reviews, honored me with the Arte and Pico award. Here's what Diane had to say: "She reviews children’s books, and her site is well-organized and professional. I admire her for helping children find that artistic part of themselves through reading." Next, a couple of weeks ago, Sabrina at Breeni Books, awarded me with the Brillante Weblog Award. Here's what she said about the Well-Read Child: "A seriously invaluable tool for home schoolers, teachers, or parents. Lots of great children's book reviews and complementary resources." This week we slacked off a little in the reading department. Not sure if it is the stifling heat and humidity we've been experiencing this week, but my daughter has been going to bed earlier than usual and has really been way too exhausted to even pay attention to books. I finished the last two books in the Twilight Saga, and I am letting it simmer a bit before I post my reviews. For those who are curious, I liked Book Three a lot, but was sorely disappointed in Book Four. There were so many flaws in the series in general, so I'm trying to get my head around it before I review. Speaking of being exhausted, I am so tired I can hardly stand on my feet, so I'm going to take a bit of a break from blogging for the next week or two. I may post here and there, but I have no particular schedule in my mind. But before I go off into no-computer land, I want to announce this week's winner of the $25 Amazon.com gift certificate: Betsy at See Besty Read! Congrats Betsy! Please email me at thewellreadchild AT gmail DOT com, and I'll send you the code for your card. While I AM taking a break from blogging, my family is still committed to reading as much as possible, so I'm going to continue my weekly giveaways. Up for grabs next week is a Surprise Grab Bag of five books (children, young adult, and adult) for the winner. I will announce the winner and the book titles next Sunday. The contest is open to all participants who've signed up for the challenge. It's not too late to sign up as this challenge is ongoing indefinitely. If you haven't signed up and want to join, please leave a comment here, and I'll add you to the list. Read this post for more information about that challenge. To be eligible for the weekly giveaway, you must sign up by Friday. Next week, I'll choose a winner using Random.org, so be sure to check back then to see if you've won.